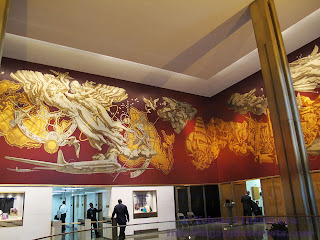 At 10 Rockefeller Plaza, the grand lobby is visited only by those who work in the building or by the official Rockefeller Center tour. But everybody can walk in an enjoy the beautiful mural that wraps around three walls of the space. Rockefeller Center complex, named after John D. Rockefeller, Jr., who leased the space from Columbia University in 1928, changed the form of mid-town Manhattan. It became one of the most successful Urban Planning projects in the history of American architecture. 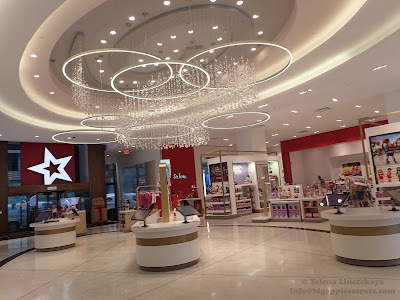 Rockefeller Center is a combination of two building complexes: the older and original fourteen Art Deco office buildings and a set of four International-style towers built along the west side of Avenue of the Americas during the 1960s and 1970s. 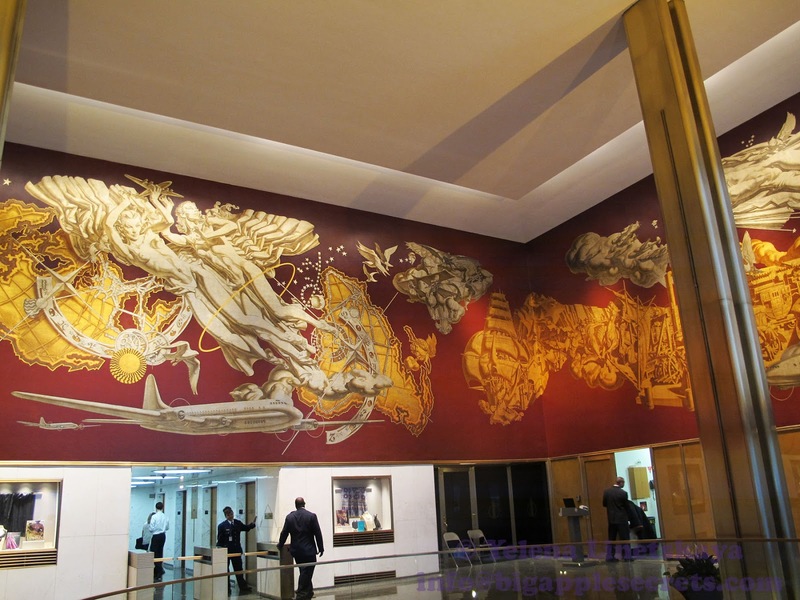 An office tower at 10 Rockefeller Plaza between 48th & 49th Streets is one of the old ones. The lot was not developed until 1937 - there was a parking lot on this site. Netherland-America Foundation was founded in New York in 1921. The Dutch, and especially its American-based business community, had a need to substantially improve its public image in the United States. 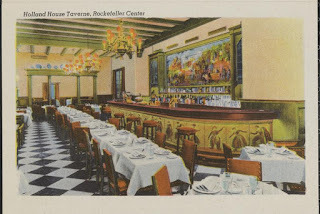 On February 15, 1938, the Foundation organized a reception at the Cosmopolitan Club, during which an ambitious plan was unveiled for the establishment of a Holland House at the newly built Rockefeller Center. A sizeable fund of $100,000 had been raised from the Dutch government and the Dutch-American business community, and several months later further plans were announced. The Holland House at 10 Rockefeller was open in 1939. The Center was comprised of the offices of the Foundation, the Chamber, the Consulate and the Netherland Club. An art gallery and the Holland House Taverne, a Dutch-theme restaurant, were opened on the premises as well. Holland House Taverne remained in business until the mid-1960s when it gave way to a Charley O's. The cuisine was a mix of Dutch, American and Indonesian cuisine. Indonesia was still a Dutch colony at that time and Indonesian food is still as popular in the Netherlands today. full occupancy of the house was cut short by of the Netherlands. In 1946 a new tenant, Eastern Airlines, settled in the building. It had a near monopoly in air travel between New York and Florida from the 1930s until the 1950s and dominated this market for decades afterward. Eastern pioneered hourly air shuttle service between New York City, Washington, DC and Boston in 1961 as the Eastern Air Lines Shuttle. 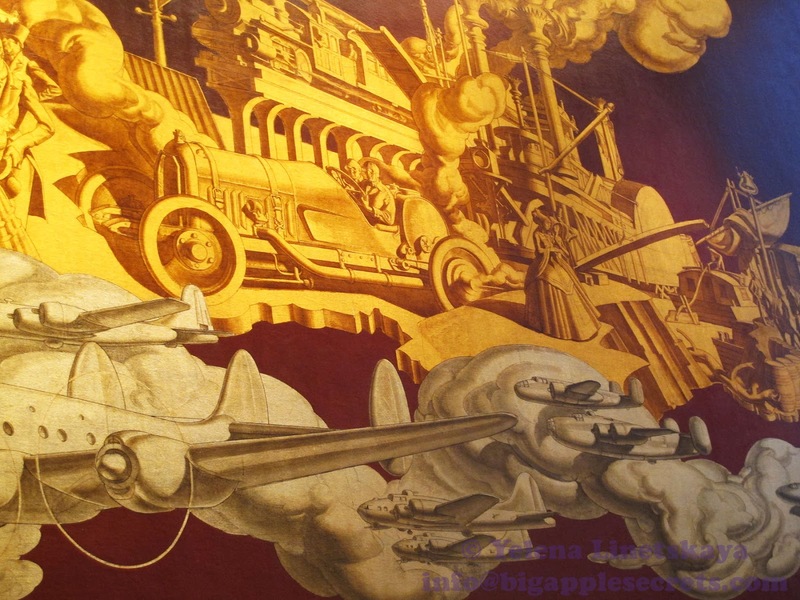 Honoring the building’s tenant in 1946, Eastern Airlines, the Rockefellers commissioned popular illustrator and muralist Dean Cornwell to create a vision of transportation. Dean Cornwell is relatively unknown now but at that time his illustrations were already popular in Harper’s Bazaar and Cosmopolitan . During his time, Cornwell was as popular as Norman Rockwell. 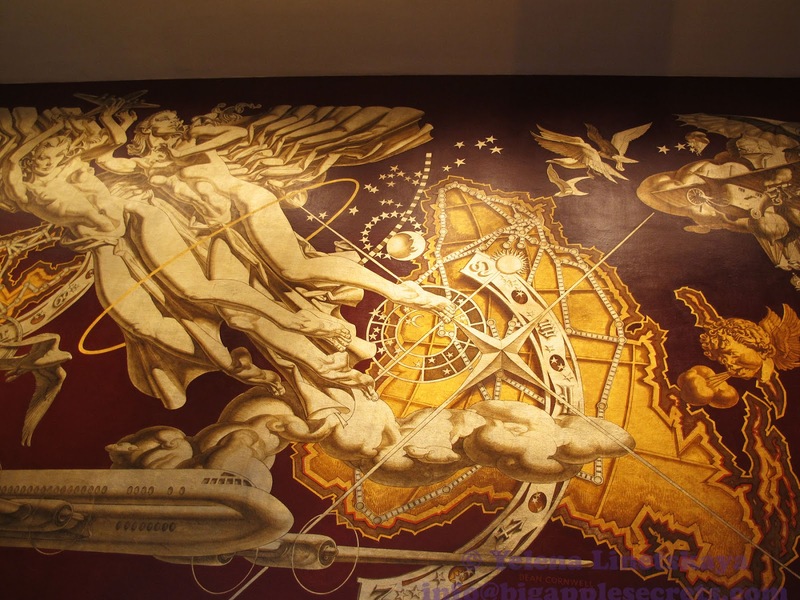 Dean Cornwell created three beautiful murals, called Night Flight, New World Unity and Day Flight in the lobby of 10 Rockefeller. Cornwell worked for two years researching and developing the images he would use. 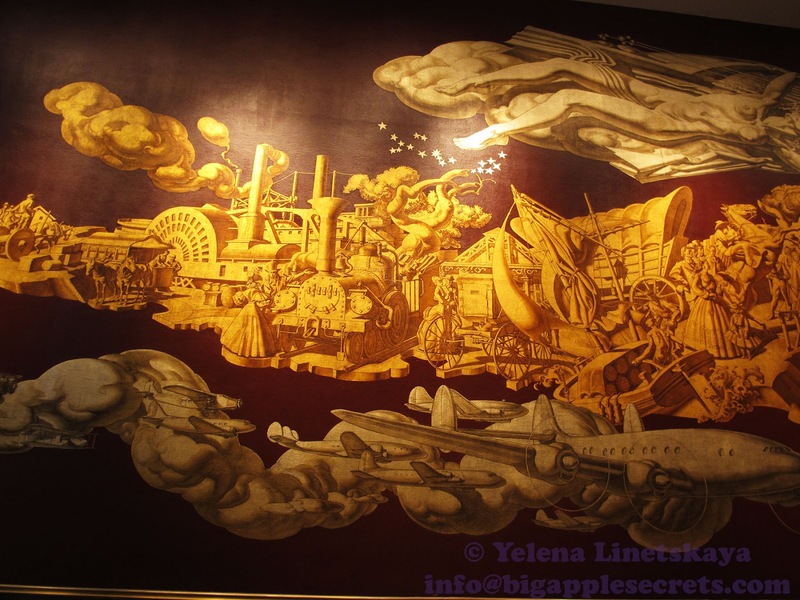 The artist portrays all modern forms of air transportation in silver while antecedents of the modern airplane ( modern in the middle of the 20th century) are in gold. 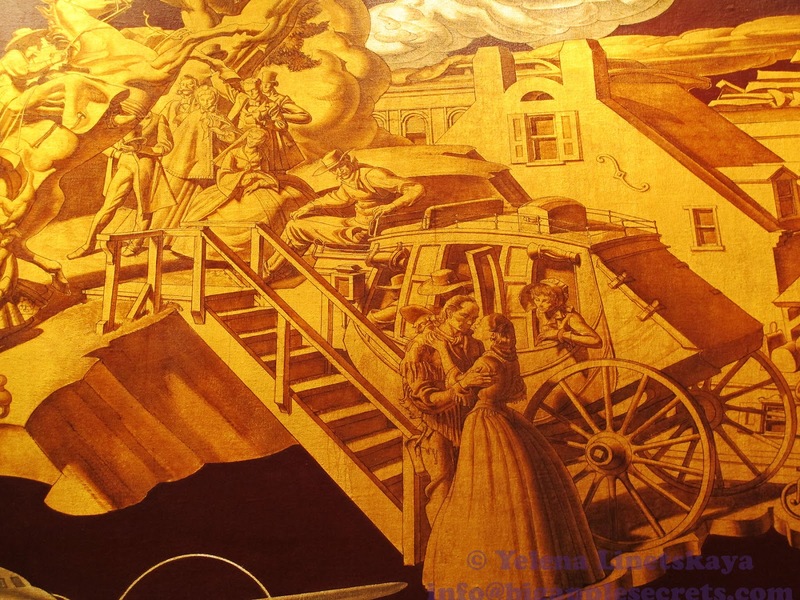 The murals portrayed the machine age from Leonardo Da Vinci's days to the present. The murals extend 45 feet in length and 20 feet in height across the north and the south walls of the lobby.